When PSG and Lyon played in the Parc de Prince early in the season, Lyon didn’t look anywhere near the electrifying presence they’ve came to be. Floundering in 12th place in Ligue 1, there was just an odd feeling to watching Lyon. If Alexandre Lacazette wasn’t scoring, then attacking wise, there was nothing else that Lyon were providing. What’s more, PSG weren’t in great form themselves but their previous track record plus the talent of the squad could just be checked off to a slow start. Fast forward to today and the stakes are infinitely more important than their first enoucnter. Lyon have managed to turn around the club in less than a half a season and create Ligue 1’s version of 2013-14 Liverpool FC: a dynamic, fast, counter attacking side that also manages to overperform statistical data led by the league’s best striker duo in Lacazette and Nabil Fekir. PSG haven’t been as thrilling to watch. By far the most talented squad, the season has been more a slog than a display of ruthless efficiency. Of course Lyon had to face PSG at the Stade Gerland without Lacazette or Milan Besivac, one of their dependable center backs, out due to injury. On the other hand, PSG put out more or less their normal starting XI for one of the biggest matches in the French football calendar. Lyon more or less want to turn games into track meets. In their 4-1-2-1-2 formation, the strikers give the necessary width and direct speed to make up for the lack of wingers in their lineup. 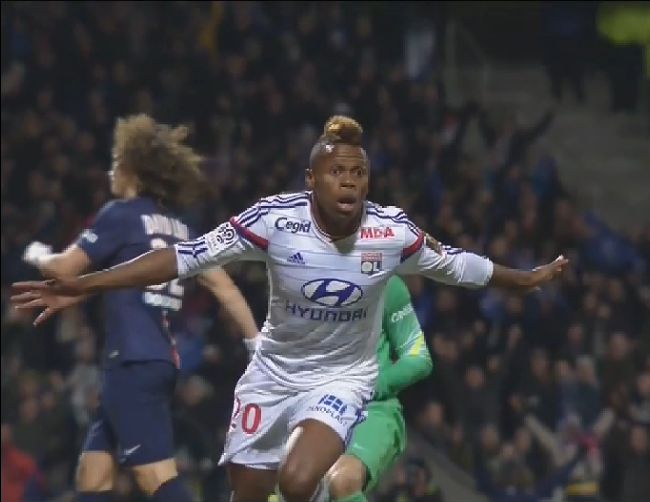 In the absence of Lacazette, Clinton N’Jie partnered up with Fekir. N’Jie is obviously not the same calibre of striker as Lacazette but he’s arguably quicker and faster, and with his very direct nature, he worked perfectly as an in-between striker/LW forward. Lyon lined up in the same formation they had in the first fixture and defaulted to a 4-3-3 defensively. They did the same thing against PSG, but instead of dropping back and allowing PSG the time on ball to pick apart the makeshift defense, they built a trapping press, similar to what you see in basketball when teams pressure around midcourt. There are obvious flaws of both playing such a high line and giving up the flanks in between the pressing lines against the likes of Lucas Moura who are very direct and can break a defense down when given that much space, but it was a risk worth taking from Lyon’s perspective. Marquinhos started at right back for PSG and although he’s been very good in his previous appearances at that position, you could live with Marquinhos having that room. PSG also aren’t a team to play long balls in behind a high pressing line, as they’re last in long balls with 54. What Lyon wanted to do was create vicious counter attacks going forward. Lyon have produced the most counter attacking shots in Ligue 1 this season according to Opta. When Lyon did press the full length of the pitch, Fekir, N’Jie and Yoann Gourcuff looked to overload on the flanks against Maxwell or Marquinhos and force PSG into costly turnovers. The problem Lyon faced in the second half was that, although PSG did allow turnovers as a result of the pressing nature, it only led to three shots total from Lyon. And yes Lyon did score on one of the three shots taken, but it took a wonderful pass from Fekir to thread the needle to N’Jie and the process of all that pressing led to an eventual drain in Lyon’s pressing activity, which PSG took advantage of. The pressing and overloading from Lyon in the second half wasn’t nearly as succinct as it was in the first half and with that, Maxwell had a greater role to play. Maxwell had two fantastic crosses in the box early in the second half that Zlatan headed on goal. Nine times out of ten those end up in the back of the net for Lord Zlatan, but the brilliance of Anthony Lopes in goal denied Zlatan on countless occasions. What was also encouraging on PSG’s end was how little Zlatan played the deep #10 hole and tried to run in behind Lyon’s defense. On the instances that PSG did play long balls over Lyon’s defenses, Zlatan beat Lyon’s backline and got in behind them. He was a fraction offside on his spectacular disallowed goal early in the match and his movement on the whole looked a lot more cleaner than in previous matches, most notably against Saint Etienne, where his movements were quite robotic and stale. The finishing still isn’t quite where it was last season, but whether it was the big game occasion or Zlatan’s overall fitness improving, this looked more like the Zlatan Ibrahimovic we’ve seen the last two seasons in PSG and not the marauding impersonation we’ve seen in the past few matches. It was a job well done from PSG’s point of view. On the balance of play, they curtailed Lyon’s attack sans Lacazette. The expected goal battle was won in a landslide by PSG (1.86-0.35) and they’ve kept Lyon only two points above them in the standings. Lyon have four of their next five fixtures away from home, including an away trip to the Stade Veledrome against title contenders Marseille in the middle of March. Meanwhile PSG still have the Champions League and the Coupe de France to worry about in addition to their quest for a third straight Ligue 1 crown. Their away fixtures against Monaco and Bordeaux might pose some troubles, and if they manage to progress past Chelsea in the Round of 16 CL tie, it will pose questions on how they’ll manage their squad depth for the stretch run in the league. For the first time since 2011-12, Ligue 1 has itself a proper title race with three legitimate contenders vying for the crown. And perhaps the best thing for French football is the overwhelming favorite going into this season (PSG) will have to fight tooth and nail for the league that in previous years was a mere stroll in the Parc (des Princes). 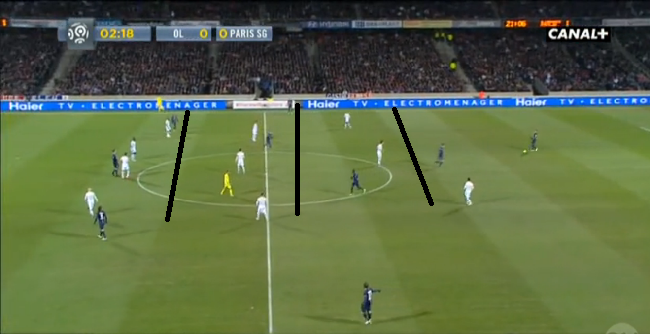 This entry was posted in Ligue 1, Tactics. Bookmark the permalink.